This tool is used to create MIK key files, using a pass phrase, and other options. The tool takes an MIE file as input, and writes an MIK file as output, using the chosen Encryption Type, Pass Phrase, and other options, to create the key. Generated .MIK files can be placed on the client PC in a directory where the MapInfo .MIE raster handler can locate them when displaying an image. Currently the MAPINFO\mikdb directory is searched for .MIK files (e.g. C:\Program Files\MapInfo\Professional\mikdb). The Input mie file: field is for entering the MIE file to cut a key for. You can type the file name directly in, or click on the browser button to choose the file using a file chooser. When you choose an Input file, the Outut mik file: field defaults to the input file name, with the extension changed to .MIK. You can change the name or location of the output file, either directly via typing, or using the browser button, to choose using a file chooser. The Encryption Type: option shows the encoding method that was used to encrypt your file. A range of encoding methods are available, including test methods for understanding and evaluating the MapImagery Encryption set of tools. Additional methods will be added as these are developed. The table below shows the existing methods for which a key is required to unlock the file.. The Pass Phrase: should be the same as the pass phrase used to encrypt the file. This field is used as one component for generating a key to unlock an .MIE encrypted image file. The Product Executable: option allows you to choose a product executable file (.EXE) file for those modes that require it. This executable file is used to generate a signature, which is used to encrypt the key. On the client side, the same technique is used to compute a signature of the application executable, which is used to decrypt the key. If the product executable changes in any way (for example a new version, or rebuild) then a new key needs to be generated. The Node Identifier: options allows you to enter a node identifier generated on a client PC. This identifier can then be used to encrypt the key, for those modes that require it. The Create a single .MIK file for directory option enables you to create a single .MIK file that can be distributed with your client software, that will enable a whole directory of .MIE files to be opened. Press the Apply button to start the key cutting process. A progress bar keeps track of progress, and it is possible to cancel the process by pressing the Cancel button (although this may leave a corrupt or incomplete output .MIK file). 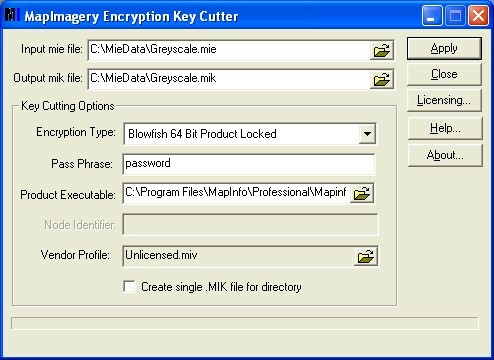 Currently MapImagery Encryption is packaged as part of MapImagery (in the future it may be packaged as a stand-alone product). 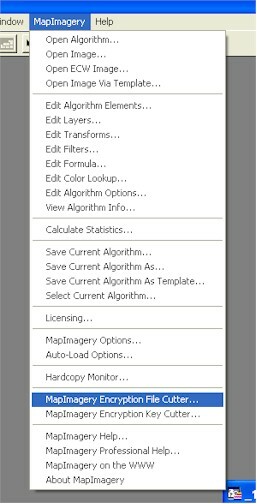 To start the MapImagery Encryption Encode tool, choose the MapImagery Encryption Key Cutter... option on the MapImagery Menu, within MapInfo Professional as shown below.